In riveting action scenes, Faith demonstrates her ability to use her pulse against a group of telekinesis masters who are so powerful they can flatten their enemies by uprooting streetlights, throwing boulders, and changing the course of a hurtling hammer so that it becomes a deadly weapon. But even with her unusual talent, the mind--and the heart--can be difficult to control. If Faith wants to join forces with Dylan and save the world, she’ll have to harness the power of both. Patrick Carman’s Pulse trilogy is a stunning and epic triumph about the power of the mind--and of love. I love dystopian reads. And when you mix dystopian with a little sci fi, yeah you got me hooked. And that's just what happened with this book. Honestly, when I started reading, I wasn't sure I liked the voice. I often find it hard to get into books that are written in third person. But once I immersed myself in this, I could not put it down. And it wasn't that it was so full of action and adventure (although that was certainly there), it was the characters, and their development and their reactions. The whole book was like a big puzzle I just pieced together and watched take shape! I can honestly say that my initial pull towards this book was not the blurb, but the cover. It's so meaningful to the book. I love that it's not faces of the characters or people in general, but it's a representation of the world Carman builds throughout the book. Faith is fairly typical for a teen. But she houses a secret that no one knows. And she also posses a power she herself can't even fathom. She's snarky and smart. She is not afraid to stand up for herself and go after what she wants. She's totally filled with attitude, which makes her a bit standoffish, but I am someone who appreciates a lot of sarcasm, and Faith certainly hits the mark in that area. She doesn't make friends easily, but when she does, she is profoundly loyal. And she tries hard not to let things get under her skin, but she can't help but feel that something is off at her new school, and something is off with those she is meeting there. One of her downfalls is how impulsive she can be. There is rarely any thinking with her once she sets her mind to something and this often leads her towards trouble. Dylan, he's quite mysterious when we first meet him. I wasn't sure if he was the brooding boy, or just shy. I venture to guess that it was all an act, knowing him as I do now. He is after something and he will stop at nothing to get it. He also won't let others get in his way, especially as he beings to form a relationship with Faith. Dylan is quite level headed and allows himself to think things through. He is not easily shaken from his position, and always has a way to reign people in. Faith's best friend, Liz, is in the story, but I can honestly say I didn't have a connection to her. I didn't feel who she was or what her purpose was, until she is used as a pawn. Then her appearance is understandable since she starts out as Faith's one true friend. Clara and Wade, well, there is something wrong with them. Their personalities are harsh and cruel. They want what they want and nothing will stand in their way, even if it means hurting a whole slew of people. I highly disliked them both (whIch I assume was what Carman was aiming for, if not, then he missed his mark). I am pretty sure Hawk is my favorite character. I love how sweet and endearing he is. And he's super smart, and not afraid to show it. His intelligence makes him seem much older than his 13 years. I was curious how he would fit into the story, since the other characters had a few years on him, but it really wasn't an issue. He's funny and a bit awkward and really not afraid to say what he wants to say. I'd like some more background on him. 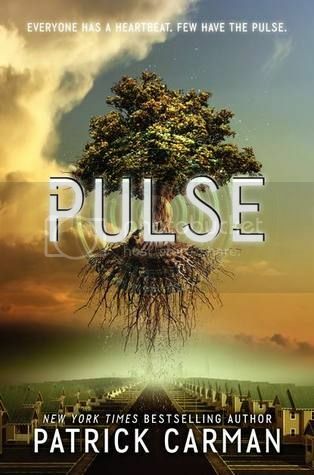 I don't want to get much into the pulses and what they mean as I think it would ruin what the story builds towards. But just know that if you are a fan of movies like Xmen or books such as Mafi's Shatter Me or Bracke's The Darkest Minds, you'll enjoy the powers the characters of this book come to find. I can say that initially I had a hard time with the tone of the book. It took me a few chapters to get the feel or what Carman was going for: A world ravished by climate change where people were slowly dwindling from the outer lands and integrating themselves into the "states". We don't get too much of what happens inside the "States' themselves. As a matter of fact, it took me until almost 1/2 way through the book to really understand that Faith and her crew of friends were living in outer territories that didn't have much to offer. And I wondered much of the time why people would not just give in and integrate into the society held within the wall, where it seems there is so much more available (technology, food, etc.). I need more background as to why there are rebel groups, as to why these people choose not to go behind the wall. This was my biggest issue with this book and the reason I could not rate it higher than 4 stars. I did like Carman's pacing. He kept me turning the pages and sucked me into the story as I wondered what was going on and where he was leading his characters. I can say that I think Carman could have introduced a better understanding of his world earlier on in the book. It took too long for me to understand what was really going on. I also love how there is all this technology amongst a land that seems so barren and unable to sustain people. It's interesting that this technology would exist outside the "states" and that the government would even allow it. While there is this underlying dystopian element, it's not really as harsh as other world's I've been introduced to. The government allows the people outside the wall more freedom than I think they would afford in a highly regulated dystopian society such as the ones we see in The Hunger Games and Divergent. If you're looking for that type of society, you won't find it in this book. Overall I really enjoyed reading this. I want to know more about the rebels. I would also like to know more about what goes on behind the wall and why the rebels choose to stay out. There has to be something within that part of society that is striking a nerve with these people. I need more of it! Looking forward to seeing how it develops in Tremor.